Another London Show star is this astonishing species that is possibly the brightest orchid species we grow. 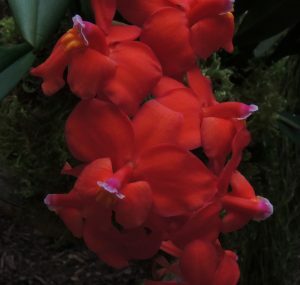 Cochlioda noezliana a startling scarlet species from the cloud forests of Colombia that has been a major influence on orchid breeding since its discovery. 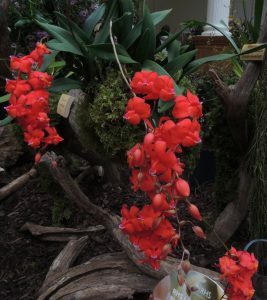 It is the orchid species behind the red in many of the red orchids hybrids sold around the world today in the Oncidineae subtribe. The glowing colour is there to attract humming birds and we displayed it at the show alongside yesterdays humming bird pollinated Masdevallia veitchiana. The other lovely pollination feature here is the two yellow beak guides on the lip to help the pollinating bird find the nectar. This species has a reputation as not the easiest to grow but we find it straight forward if you stick to the cool moist conditions of its cloud forest home (our cool Americas section) and display plant has five spikes in flower and another three spikes coming.